Previously, I wrote about building a Docker container for Munki with Chef installed. Having built that container, it’s now time to put it to use. Assuming you’ve got a working Chef server set up, we can run our Munki-with-Chef container and register it. First, we need to set up the CA we’re going to use with Munki, via Chef. This will also assume you have a chef repo in ~/chef-repo/ that is set up according to the Chef documentation. I’ve described the general process in a previous blog post here, but I’ve changed enough of it that I’m going to repeat a lot of it here. Pick any passphrase you want. In this blog post, I’m going to call this container “munki2” so as not to interfere with my existing Munki container. This run command sets the open port to 443, for SSL connections, and uses the munki2-data data container to access the repo. In addition, I’ve set the hostname here manually as well, using the -h option. docker exec munki2 /usr/bin/chef-client --force-logger --runlist "recipe[x509::munki2_server]"
Here, we’re using the [x509::munki2_server] recipe to generate a private key and send a CSR to the Chef CA. The three important file paths that must be correct are ssl_certificate, ssl_certificate_key, and ssl_client_certificate. If any of these paths are wrong or can’t be found, Nginx will not start and your Docker container will immediately halt. For reference, the ssl_protocols and ssl_ciphers are configured for perfect forward secrecy. Otherwise, the configuration for Nginx for the Munki repo remains the same as the non-SSL version – we’re serving the file path /munki_repo as https://munki2/repo/. We have a working Munki server on port 443, now it needs to be populated. Detailed instructions on configuring Munki with SSL certificates can be found on the official wiki, but I’m going to recreate the steps here. This recipe copies the client certificates from /etc/ssl/ into /Library/Managed Installs/certs/ where Munki can use them. sudo defaults write /Library/Preferences/ManagedInstalls SoftwareRepoURL "https://munki2/repo"
sudo defaults write /Library/Preferences/ManagedInstalls SoftwareRepoCACertificate "/Library/Managed Installs/certs/ca.pem"
sudo defaults write /Library/Preferences/ManagedInstalls ClientCertificatePath "/Library/Managed Installs/certs/clientcert.pem"
sudo defaults write /Library/Preferences/ManagedInstalls ClientKeyPath "/Library/Managed Installs/certs/clientkey.pem"
I’ve previously written about building Munki in Docker, and then going a step further and using Puppet’s SSL client certificates for Munki in Docker. That method allowed us to set up a Munki server in a Docker container that used Puppet’s SSL certificates to offer a secure Munki connection with Puppet clients. Continuing on the theme of testing out Chef for DevOps, I’d like to try a similar workflow. See my previous blog post about setting up SSL client certificates with Chef. Once we have a Chef server configured similarly to the aforementioned blogpost, let’s build a Munki Docker container that utilizes Chef. Chef already has existing containers to build on, but we’re not going to use those. Rather than rebuild an nginx server on top of a container already containing Chef, I’m instead going to add Chef to my existing Munki container. The upside to doing it this way: this is how Opscode builds their own Chef containers, so we’re doing exactly what they want and expect. The downside is that we have to install curl just to use it once, during build – and never again. This violates the principles of a small single-purpose Docker container, as I outlined in a previous blog post here. That being said, it’s easier just to do it the way Chef expects and just go with it. Note the two files that have be to added – client.rb and validation.pem. The validation.pem is called the Chef validator. It’s the private key that gets created when you create an organization (note that the docs refer to it as file.key instead of file.pem, but it’s the same file). This file needs to be added to all clients before they can register with the Chef server, and this Munki container is no exception. You’ll need to copy your organization’s private key file from the Chef server or workstation to the Docker host to build this image. As you can see in the client.rb file, I’m specifying the Chef server URL, the name of the validator (based on the organization I created, mentioned above), and enforcing SSL verification – which requires a trusted SSL certificate for your Chef server (meaning you can’t use the self-signed default certificate provided by the Chef server on first run). docker build -t "nmcspadden/munki-chef" . Next post is where we run it! Recently, I presented at the MacBrained.org February 2015 Meet-up at Facebook. Introducing Docker to Mac Management. A full recap of the event can be found on MacBrained.org. I’d like to point out that most of the presentation was demoing actual Docker usage, and I didn’t cover a good chunk of the slides – so there’ll be some material in the slides I didn’t talk about. WebHelpDesk, among its other features, makes a great inventory aggregate collector thanks to its use of discovery connections. Inventory data can be easily pulled from any flat database. Sal is a reporting engine for Munki that collects inventory data about OS X Munki clients, and JAMF Casper as an iOS MDM (referred to as Casper or “JSS” from here on out) stores inventory data about iOS clients. We can set up scripts to pull data from Sal, using Sal-WHDImport, and from Casper, using JSSImport. This makes for a great triangle, allowing inventory aggregation into WebHelpDesk, and this is relatively trivial with Docker. To save some time, I’ve incorporated the Sal-WHDImport script into Sal itself in a Dockerfile, available as the Sal-WHD container. We’ll be using this container below. I’ve done the same thing with the JSSImport script, creating the JSSImport container. Sal requires some modification in order to talk to WebHelpDesk. We’re going to use a plugin Graham Gilbert wrote called WHDImport to sync the Sal data into a single flat database for WebHelpDesk to pull from. Add 'whdimport', (with the comma) to the end of the list of INSTALLED_APPS. MacModelShelf was originally developed by Per Oloffson, but this version is my fork that uses a JSON database, which seems to improve cross-platform compatibility. The purpose of cloning a local copy is to keep the JSON database, which is automatically populated with model lookups. By keeping a local copy, we can safely spin up and down WebHelpDesk containers without losing any of our lookup data (which may save milliseconds in future lookups). First, we create a data-only container for Sal’s Postgres database, and then run the Postgres database. We can specify all the variables at runtime using the -e arguments. The only thing you’ll need to change below is the password. We do the same thing with the JSS Import container’s database. Again, change the password only. Note that we’re using a slightly different Postgres container for this – the macadmins/postgres instead of grahamgilbert/postgres. There’s a theme here – change the password for WebHelpDesk’s Postgres database. Load a temporary container just for the purpose of setting up Sal’s Django backend to incorporate the WHDImport addition. Note that we’re using --rm with this docker run command, because this is intended only to be a transient container for the purpose of setting up the database. It will remove itself when complete, but the changes to the database will be permanent. After exiting, the temporary “sal-loaddata” container is removed. Run the JSSImport container, which will pull the device list from Casper and sync it into the jssimport database. If you haven’t already, set up an API-only user account in the JSS, and use those credentials below. Change the URL to match your Casper instance. Although I haven’t tested this particular permutation, you could theoretically build a JSS Docker instance, and then link it to the jssimport container (--link jss:jss), and just use the URL -e JSS_URL=https://casper. Now run WebHelpDesk with its linked databases. WebHelpDesk now has direct access to three linked databases – its own Postgres database, as db; the Sal database, known as saldb; and the JSS Import database, known as jdb. This will make it trivially easy to pull the data it needs. In WebHelpDesk, go to Setup > Assets > Discovery Connections. Make your two connections for Sal and the JSS. Now, you have a single web service that handles all inventory collection. docker exec sal python /home/docker/sal/manage.py syncmachines (since the sal container is daemonized and runs persistently). docker run --rm --name jssi --link jssimport-db:db -e DB_NAME=jssimport -e DB_USER=jssdbadmin -e DB_PASS=password -e JSS_USER=user -e JSS_PASS=password -e JSS_URL=https://casper.domain.com:8443 macadmins/jssimport (since this container is a fire-and-forget container that self-deletes on completion). You could set up a crontab to run those two tasks nightly, and then set up WebHelpDesk’s internal syncs to its discovery connections to occur just an hour or so afterwards. Once your inventory data is aggregated, you could use other tools like my WHD-CLI script to access WebHelpDesk via a Python interpreter, allowing for more scriptability. This is also available in a Docker container. Using WHD-CLI, you have instant scriptable access to your inventory system, which could be used for lots of neat things, including a way to guarantee that a Puppetmaster only signs approved devices. Lots to explore! One of [WebHelpDesk]’s many useful features is the ability to set up discovery connections that pull data from other sources into its own database. WebHelpDesk comes with a built in JAMF Casper Suite connection (which will be referred to as “JSS” from here on), but it only applies to Computers. If you have Casper for iOS, it doesn’t pull iOS devices. I have Casper only for iOS devices, with no Computers at all, so this discovery connection fails for me. That’s not a big problem, though, because you can also set up a raw database or table view to pull data from instead. Since WHD can pull data from any database it can access, we just need to find a way to get that JSS data into a nice flat database. The JSS does have its own MySQL database to store data in, but in general we don’t really want to access that directly. We want to keep our databases separate and isolated from each other, both for safety and robustness. Also, the tables and ways that Casper stores information into its database are private implementation details, and we can’t rely on those being the same between updates. It’s entirely possible that Casper 9.7, or Casper 10, will change existing database structure, and any discovery connection we set up in WebHelpDesk that pulls data from certain tables might break. Not much point setting up an automation that can’t be relied upon. Instead, Docker makes it easy for us to set up a quick database for WHD to access. All that needs to be done is writing a script that pulls data from Casper and populates the database, so that WHD can use a discovery connection to access it. The repo for this script can be found on Github here. The script makes use of Shea Craig’s incredible Python-JSS tool, which provides a Python command line interface to the JSS’s REST API, also documented on MacBrained.org. The database preferences file needs to have credentials for access to a Postgres database to store the data in for WHD to pull from. The JSS preferences file needs to have credentials for access to a Casper instance, along with a username and password with API permissions. This function takes an SQL connection (created by the psycopg2 connector) and then creates the basic Casper table that we’re going to populate, if it doesn’t already exist (thus providing idempotence). This is the main meat of the script – it’s also known as an “upsert” from the Postgres manual. It takes a given device (i.e. a single device record polled from the JSS), creates a new function called merge_db that contains all the fields from that device that are relevant, and then updates the record in the new database table if it exists, otherwise creates it if not already found. Since we have a working script that pulls data from the JSS via API and puts it into a Postgres container, it seems only natural to Dockerize it. The Docker image can be pulled from the Docker hub here. Aside from the epic amount of environmental variables, the Dockerfile is fairly simple. Install Python’s setuptools and pyscopg2 module, and then install python-jss by running setup.py install. Add the JSSImport script. Finally, add the runtime execution script, which replaces the contents of the two preference files (the JSON and Plist files) with the environmental variables, and then executes the sync. This container is not intended to be a daemonized running container. It executes the JSSImport script and then stops, so using –rm for each execution is ideal – we don’t really need it to linger around after finishing since it doesn’t do anything on its own. The jssimport-db database container is now populated with the mobile device list from the provided JSS, and can be sourced for WebHelpDesk’s discovery connections. You’ll want to run a WebHelpDesk docker container. For more information about that, see my previous blog post on running WebHelpDesk in Docker. Once attributes are mapped, save the connection, go back and hit “Sync Now” and watch the import. The end result should be that WebHelpDesk now pulls in all the mobile devices from your Casper instance, through the roundabout means of API -> database -> discovery connection. Munki is an incredible tool for Mac deployment. Unlike other MDM or management software, it’s focused on a single purpose – delivering files from a central repository to a client machine based on some criteria. It doesn’t include features like inventory tracking, reporting, queries, or other items that you might find in commercial management solutions and suites. Since Munki is open source and has a thriving community of dedicated users, it’s no surprise that solutions have been developed to add this kind of functionality to Munki. There are a number of options out there, but the one I’m going to focus on is the open-source version of Sal, written by Graham Gilbert. Sal is Django-based web app that collects information from Munki clients whenever they run the Munki software. It allows for convenient access to inventory collection, which can give us an idea of what OSes we’re seeing on our clients, what software packages are installed, what updates are still pending, etc. Information and reporting is always good, and Sal does a great job. Sal has solid documentation for using it and getting started, so I won’t reproduce all of that here. Instead, I’m just going to go through a simple setup of the Sal Docker container and installation on client devices, from start to finish. As suggested by the repo instructions, the Docker image is the officially recommended approach for setting up Sal. First, you’ll need to get Graham’s customized Postgres database running. His customization allows for easy database creation by passing in environmental variables, which I used in a previous blog post about customizing Postgres. The -e environment variables allow us to specify the database name, user, and password for access. Specify real passwords for use in production, obviously. I’ve also passed in the DOCKER_SAL_TZ timezone environmental variable to change it to PST, since I don’t live in London. Open your web browser to http://localhost/ on the Docker host to log into Sal – using the password you specified earlier. Create at least one Machine Group. Each Machine Group will generate a “key,” which you’ll need to add to the clients. 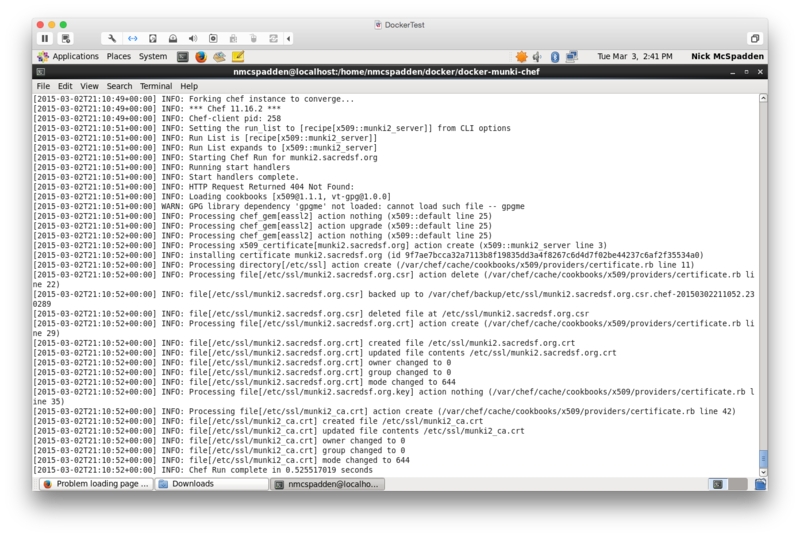 Install the provided Sal-scripts.pkg onto an OS X client with Munki installed. If Sal has not been added to your DNS (if you’re testing this for the first time, this will almost certainly be true), you’ll need to modify /etc/hosts on the client to add in your Docker host as “sal”. Next, you’ll need to add the proper client configuration to your OS X clients. Sal report submmitted for Mac.local. After spending lots of time blogging about my Docker images, I took some hard looks at my Dockerfiles and noticed a recurring pattern. I have a lot of Github projects for various scripts and tools, and my general strategy for making Docker images out of those tools / scripts / services is to build a Dockerfile that clones the git repo into the container on build. This is fantastic for guaranteeing I always have the most up to date scripts in my containers – but it means I have to install git in every container. Git has a lot of dependencies and brings a lot along for the ride, including a full Perl installation. That’s a lot of extra beef to throw into a container, and it doesn’t really make any sense to do so if the primary process of the container doesn’t rely on Git. Rather than installing Git, we can use ADD directives in the Dockerfile to add a file from a remote URL. Since these projects are hosted on Github, we can download a tarball or zipfile of the repo and install from there – thus avoiding the use of git clone completely. After learning about this, I went back and examined some previous Docker containers and found several candidates for optimization. In all of the following examples, these changes have now been merged into the master branches and the Docker images have been updated. Docker-JSSImport contains a Dockerfile that installs git to clone a Github repository. As you can see here, we install git from apt and then use git to clone the JSSImport script into a specific location. There’s no expectation that git will ever be used in the lifetime of this container, since this container’s specific purpose is to run a python script based on JSSImport, and then stop. So git provides only unnecessary space usage, with no added benefit. Rather than installing git at all, we instead use the ADD directive to directly add a tarball (a .tar.gz archive) of the entire repo located at $APP_DIR/master.tar.gz. Then we use the tar command to unzip and extract the contents of that source repo, and then remove the tarball. This accomplishes the same thing as git clone, in that we always get an updated copy of the repo whenever this image is built, but we didn’t have to install git and all its dependencies. In addition, we’ve removed pip from the install as well, and instead we install Python-JSS by using the setuptools’ setup.py install method. Since pip brings a lot of friends along with it, this is helpful savings. By far, the biggest and most significant change is rebasing it off of Debian instead of Ubuntu. The base Debian image is almost 100 mb smaller than the base Ubuntu image, and there’s nothing in the Ubuntu image that we need for this image that Debian doesn’t have. Just by switching to Debian, we eliminate even more space storage, with no loss in functionality. We shaved off 140 megabytes by removing git and pip, and switching to Debian. The Munki-Puppet docker image is another example. Rather than install git, I installed wget to download a package to install. While wget is slimmer than git in terms of space taken up, it’s still unnecessary, since wget isn’t used at any point in the container’s script execution. What are the size savings? Only 6 MB difference this time. Not huge, but every byte counts, right? The Puppetmaster-WHDCLI project is another candidate for optimization, this one also using git in the Dockerfile. That’s a significant difference! We saved 220 MB from doing this. WebHelpDesk has a bit of an unfortunate Dockerfile, because SolarWinds doesn’t offer the RHEL RPM for download uncompressed. If the RPM was on the internet available as an .rpm file, we could install it directly from the internet and save time (and space!). Since it’s only available in .rpm.gz, we do in fact have to download and decompress it before installing. Regrettable use of space in a Docker image, but unless they change that, we don’t really have any other choice. Using ADD is much cleaner and saves a few steps, although I did end up combining the yum install and rm commands onto one line – no need to have separate layers for those instructions. Not great, but 40 MB is still something. The general theme here is to avoid adding in packages or tools in the Dockerfile just for building something, if we’re not going to use it. If we need to obtain files remotely, the ADD directive does that for us. Installing git, curl, wget, or some other remote download tool is a waste of space and time a Docker build. In a previous post, I showed how to use Munki with Puppet SSL Client certificates in a Docker image. In that example, the Puppetmaster image is set to automatically sign all certificate requests. Good for testing, but not a good idea for production use. Instead, we should look into Puppet policy-based signing to sign requests only based on some credentials or criteria we control. This means that random nodes can’t come along and authenticate to the Puppet master, and it also means that the Puppet admin won’t have to manually sign every node’s certificate request. Manually signing works great for testing, but it quickly spirals out of control when you’re talking about dozens, or hundreds (or thousands) of machines. Puppet’s policy-based autosigning allows us to execute a script. The exit code of that script determines whether a certificate is signed or not (exit code 0 means we should sign). So we need to write a script that will check something about the client that lets us determine it’s “ours” or “safe,” and sign accordingly – or reject. Well, we have a really easy to way to do that – why not look up the client in inventory? We have WebHelpDesk, with its customized Postgres database, which can track inventory for us. If we’re using WebHelpDesk for inventory (as I am), then an autosign script that checks the WHD inventory for ownership would be an effective way to screen for cert requests. One of WebHelpDesk’s best features, in my opinion, is its REST API, which allows us to make requests from WebHelpDesk’s backend in a more automated fashion than via the web interface. Using the REST API, we can develop scripts that will manage information for us – such as the one I wrote, WHD-CLI. I’ve even made a separate Docker container for it (which is admittedly better documented than the original project), although we’re not actually going to use the container separately for this purpose (as there’s no way to get Puppet to use an autosign script that isn’t installed locally, so having it exist in a separate Docker container isn’t going to help us). So, we have WebHelpDesk, which has inventory for our machines. We have a script, WHDCLI, which allows us to query WebHelpDesk for information about devices. We have the Puppetmaster container, which is running Puppet. Let’s combine them! Since we have a nice Puppet master container already, we can use that as a baseline to add our WHD-CLI scripts onto. Use ADD to download the Requests project. Requests is an awesome Python library for handling HTTP/S requests and connections, much more robust and much more usable than urllib2 or urllib3. Unfortunately, it’s not a standard library, so we’ll need to download a copy of the module in tarball form, then extract and install it ourselves. The WORKDIR directive changes the local present working directory to /home/requests before the next command. This is equivalent to doing cd /home/requests. Now we use the Python setuptools to install Requests so it’s available system-wide, in the default Python path. Same thing happens here to WHD-CLI – clone the repo, change the working directory, and install the package. In the Puppetmaster image, we already have a Puppet configuration file – but as I documented previously, it’s set to automatically sign all cert requests. Since we’re changing the behavior of the Puppet master, we need to change the configuration file to match our goals. The major change here is the autosign directive is no longer set to “true.” Now, it’s set to $confdir/check_csr.py, a Python script that will be used to determine whether or not a certificate request gets signed. Note also the use of csr_attributes = $confdir/csr_attributes.yaml directive – that’ll come into play in the script as well. Add in a default WHD-CLI configuration plist. This will be used by WHD-CLI to get API access to WebHelpDesk. Here’s the actual script that will be run whenever a certificate request is received on the Puppet master. An in-depth look at it comes later. As we’ll see later in-depth, the script will log its results to a logfile in /var/log/check_csr.out. To prevent possible permissions and access issues, it’s best to create that file first, and make sure it has permissions where the Puppet master can read and write to it. These last two commands are copies of those from the original Puppetmaster image. Since we’re adding in new stuff to /etc/puppet, it’s important for us to make sure all the appropriate files end up in the right place. The goal of an autosign script is to take information from the client machines (the Puppet nodes) and determine if we can sign it based on some criteria. In this use case, we want to check if the client nodes are devices we actually own, or know about in some way. We have WebHelpDesk as an asset tracking system, that contains information about our assets (such as serial number, MAC address, etc. ), and we already have a script that allows us to query WHD for such information. So our autosigning script, check_csr.py, needs to do all of these things. According to Puppet documentation, the autosigning script needs to return 0 for a successful signing request, and non-zero for a rejection. A logical first choice would be to ask the client for its serial number, and then look up the serial number to see if the machine exists in inventory, and exit 0 if it does – otherwise reject the request. The first question is, how do we get information from the client? This is where the csr_attributes.yaml file comes into play. See the Puppet documentation on it for full details. In a nutshell, the csr_attributes.yaml file allows us to specify information from the node that goes into the CSR (certificate signing request), which can then be extracted by the autosigning script and parsed for relevance. Specifically, we can use the CSR attributes to pull two specific facts: serial number, and whether or not the machine is physical, virtual, or a docker container. The two extension_request prefixes are special Puppet OIDs that allow us to add attributes to the CSR – essentially they’re labels for what kind of data can be put into the CSR. The serial number has been replaced with what the VM reports, and the “virtual” fact is replaced by the word “vmware”, indicating that Facter recognizes this is a virtual machine from VMWare. This will be important in our script. For convenience, I have a GitHub repo for installing these attributes (built with Whitebox Packages) available here. A release package is available for easy download. The autosign script, when called from the Puppetmaster, is given two things. The hostname of the client requesting a certificate is passed as an argument to the script. Then, the contents of the CSR file itself is passed via stdin to the script. So our script needs to be able to parse an argument, and then read in what it needs from stdin. This sets the basic log level. This script has both INFO and DEBUG logging, so if you’re trying to diagnose a problem or get more information from the process, you could change level=logging.INFO to level=logging.DEBUG. It’s much noisier, so best for testing and probably not ideal for production. Migrating the logging to standard out so that you can use docker logs is a good candidate for optimization. The hostname for the client is the only command line argument passed to the script. In a test OS X default VM, this would be “mac.local”, for example. The actual contents of the CSR gets passed in to stdin, so we need to read it and store it in a file. If there’s no line in the CSR containing that data, that means the CSR didn’t have our csr_attributes.yaml installed (and is almost certainly not something we recognize, or at least not in a desired state and should be addressed). Thus, reject. Our second attribute is the Facter virtual fact. If we don’t find that either, then we still have an incorrect CSR, and thus it gets rejected. This was mostly for my own convenience, but I decided it was safe to Puppetize any virtual machine, such as a VMWare Fusion VM (or ESXi, or whatever). As VMs tend to be transient, I didn’t want to spend time approving these certs constantly as I spun test VMs up and down. Thus, they get autosigned. If it’s a Docker container getting Puppetized, autosign as well, for mostly the same reasons as above. Once the CSR is parsed for its contents and some basic sanity checks are put into place, we can now actually talk to WebHelpDesk. Parse the .plist we passed in to the Puppetmaster image earlier for the API key and URL of WebHelpDesk, and load up the API. Note the False at the end of the WHD() call – that’s to specify that we don’t want Verbose logging. If you’re trying to debug behavior, and want to see all the details in the log file, specify True here (or eliminate the extra variables just call whdcli.WHD(whd_prefs), since the other three variables are optional). This is the real meat, right here – w.getAssetBySerial() is the function call that checks to see if the serial number exists in WebHelpDesk’s asset inventory. If this serial number isn’t found, the function returns False, and thus we reject the CSR by exiting with status code 1. Configure WebHelpDesk via the browser to use the external Postgres database (see the penultimate section on Running WebHelpDesk in Docker for details). Once WebHelpDesk is set up and you’re logged in, you need to generate an API key. Go to Setup -> Techs -> My Account -> Edit -> API Key: “Generate” -> Save. Install Facter, Hiera, and Puppet on an OS X VM client (or any client, really – but I tested this on a 10.10.1 OS X VM). Install the CSRAttributes.pkg on the client. If your Puppetmaster is not available in the client’s DNS, you’ll need to add the IP address of your Docker host to /etc/hosts. The VM should generate a certificate signing request, send to the Puppet master, which parses the CSR and notices that it’s a virtual machine, and then autosigns it and send the cert back. INFO:__main__:Serial number not found in inventory. Try this on different kinds of clients: Docker containers (a good candidate is the Munki-Puppet container which needs to run Puppet to get SSL certs), physical machines, other platforms. Test it on a machine that is not in WebHelpDesk’s inventory and watch it get rejected from autosigning. cat /opt/varpuppet/lib/puppet/ssl/ca/requests/testvm.local.pem | /opt/puppet/check_csr.py "testvm.local"
If you get a traceback here, it’ll tell you the reason why it failed – perhaps a bad URL, bad API key, or some other HTTP authentication or access failure. Embarrassingly, in my first test, I forgot to Save in WebHelpDesk after generating an API key, and if you don’t hit the Save button, that API key disappears and never gets registered to your WHD account. The response here will tell you what to expect – did it find a serial number? It’ll give you asset details. Didn’t find a match? The response is just False. Important Note: Although this post makes use of Docker as the basis for all these tools, you can use the WHD-CLI script with a Puppetmaster to accomplish the same thing. You’d just need to change the WHD URL in the whd-cli.plist file. One of the best aspects of Docker is that you can take individual pieces, these separate containers, and combine them into amazing creations. Just like LEGO or Minecraft, you take small building blocks – a Postgres database, a basic Nginx server, a Tomcat server – and then you add features. You add parts you need. Then you take these more complex pieces and link them together. You start seeing information flow between them, and seeing interactions that were previously more difficult to setup in a non-Docker environment. In this case, we took separate pieces – WebHelpDesk, its database, and Puppetmaster, and we combined them for great effect. Combine this again with Munki-Puppet and now you’ve got a secure Munki SSL environment with your carefully curated Puppet signing policies. There are more pieces we can combine later, too – in future blog posts. In a previous post, I walked through the process of creating a customized Postgres database container in Docker that accepts remote connections. The main purpose of that container is to use with WebHelpDesk, a Tomcat-based ticketing and asset tracking system. WebHelpDesk does include an embedded Postgres database that it can use to keep track of its internal data (which is probably how many customers use it, including myself prior to Dockerizing it), but that gives us some problems. First off, we have to make sure we preserve all data in that Postgres database, so that it survives independent of the container. Secondly, the embedded Postgres version does not live in the same place as a “typical” Postgres install, and thus makes special configuration or tuning more awkward. By using an external database, we can exert far more control over the actual database’s running parameters (and make changes far more easily). All of these are good reasons to use an external database, which is what we’re going to do with the macadmins/postgres image. In this post, I’m going to run my Dockerized version of WebHelpDesk. This blog post is an extended version of the README for the WebHelpDesk Docker image. Here, we use -p 8081:8081 to map port 8081 in the container to our localhost:8081. The container is now running, so we can access it via the web browser at http://localhost:8081/ on the Docker host. The first time you launch WebHelpDesk, it goes through its initial setup. Obviously, if you changed any of the -e DB_XXXX environmental variable values in the docker run command above, recreate those values above for the username, password, and database name. You can click the “Test” button to verify that the database connection works. Note: if you try using a regular Postgres database, such as the default Postgres container, instead of the customized one, you’ll notice that the database connection will always fail. You can skip email customization, it’s not required for setup. Set up your preferred administrative account name & password. In the interest of best practices with security, consider using a username that isn’t “admin” for a production system. Continue setup until you are asked to log in, and then use the credentials you specified above for name & password. One significant note is that we’re running WebHelpDesk over HTTP, meaning it’s not secured. You’ll almost certainly want to configure WebHelpDesk for SSL before promoting into production use. Additionally, you’ll probably want to get an actual SSL certificate, and not used a self-signed one. Note that if you do set up SSL, Tomcat stores the private key for its SSL cert in its keystore, located at WebHelpDesk/conf/keystore.jks. This keystore will need to be preserved, because if the WebHelpDesk container is ever removed, so will that keystore, along with the private key that generated the CSR. If you spin another container up, your SSL certificate will most likely not be valid due to non-matching private keys in the keystore. Configuring WebHelpDesk for SSL in Docker is a good topic for another blog post. The Docker registry provides an official Postgres container that can be used in a wide variety of situations. However, at its default configuration, Postgres does not accept remote connections from other IP addresses. This presents a problem when used with something like WebHelpDesk, which needs a Postgres database to slave off of. To address this issue, we’re going to create a new Docker container based on Postgres that changes the appropriate settings in pg_hba.conf. The repo for this project can be found here. Start with the official Postgres image. These three environment variables are going to be passed to the setup_database.sh script. This technique was originally developed by Graham Gilbert for his Postgres docker container for the use of Sal. The purpose of these environment variables and the script are to create a starting database for us to use. Add in the script to setup remote connections. The location of this script, /docker-entrypoint-initdb.d/ is a special directory provided by the default Postgres container to extend additional tasks on startup. All scripts located in this directory get run on startup – thus we can add Postgres configurations automatically. Chmod sets correct execute permissions on the script. This sed statement modifies /var/lib/postgresql/data/pg_hba.conf to allow for remote access connections – see documentation here. It simply adds 172.17.0.1/16 to the list of trusted access locations that are allowed to make database updates. The 172.17.0.1/16 range is for Docker IP addresses – thus giving any other Docker container necessary access. This is specifically intended for use with WebHelpDesk, which requires it. This script, as mentioned previously, was shamelessly stolen from Graham Gilbert – thanks for that. It sets up the initial database with correct role and privileges, using the environment variables. The script executes on startup of the Docker container, and sets up the database we need to use by reading in the environment variables we pass in using the -e argument to docker run. We’ll see this in action later. docker build -t name/postgres . You’ll be at the psql prompt, and you can type \l to list all the databases. You’ll see the one we created, db, in the list (which does not format well, so I haven’t tried to copy and paste it here). Looks good, right? Now the database is ready to be used by any application or service by linking the customized Postgres container to another one. We’ll do an example of this in another post. Dockerfiles are pretty neat things. They allow us to do fun stuff, like take someone’s else’s image as a base and build more stuff on top of it. This is the basis for nearly all of the images I use – find someone else who did the hard work, like installing Nginx, or Apache, or a database like Postgres or MySQL, and then add the pieces I need to get the results I want. I pointed out earlier that Graham Gilbert already has a great Postgres container that incorporates the database setup script. All I’m doing differently is configuring Postgres to allow remote connections as well. So there’s no particular size advantage to doing it the “alternative” way, except that the Dockerfile is a bit smaller and we do less wheel-reinvention. But there are some pros and cons, and it depends on what you want to do. By using Graham’s Postgres container, it’s easy for us to set up an automated build on the Docker registry that rebuilds ours every time Graham rebuilds his. If he ever updates his database setup script, or updates his container for any reason, ours gets rebuilt to incorporate his changes. This is both a pro and a con, because it means that our Postgres database’s behavior might change in the latest build without our knowledge (or approval). If Graham decides to change his container to do something different at startup, and we’re designing our Postgres databases around assuming a specific behavior happens at startup every time, we could be in trouble if an unexpected change occurs. On the other hand, if it turns out we do want to incorporate Graham’s changes automatically, using his image as the basis for our build saves a lot of time – I don’t have to make any changes to my Dockerfile to upstream those changes into our builds. The shorter answer for me is that I need to make sure the database setup occurs the way I expect it to every time I use it – and thus I manually recreate Graham’s setup in my own Dockerfile. That way Graham can make any changes to his Dockerfile he wants and it won’t affect our own builds. Ultimately, we end up with a Postgres database (which accepts remote connections on startup) that we can easily use again and again.